As you know, Blogger have few limitation including meta descriptions, we have made detailed blogpost on Blogger Meta Tags. You can view details for different meta tags for each blogger page or post. 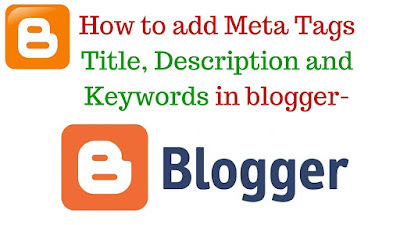 Step by step instruction for Add meta tags in Blogger. Open blogger and click on Theme from left sidebar and click Edit HTML option. Add following code exactly after <head> tag. Important: Change the Red text to your own. After last line of above code type below code. By adding above codes, blogger will automatically create meta tags and description for all pages and posts.